The Kern County Planning Commission voted unanimously Monday to support an ambitious proposal that would streamline local oil permitting, turning back late proposals requested by members of the agriculture industry and even the board’s chairman. The commission’s recommendation to certify a massive environmental review and amend the county’s zoning ordinance shifts attention to the county Board of Supervisors, which is expected to give final consideration next month to a permitting project it initiated more than two years ago at the request of the state’s oil industry. If approved by board, the new permitting process would take effect Jan. 1. In a four-hour discussion that touched on concerns by environmental groups and farmers, the commission took what one member saw as a precedent-setting action to support one of the county’s primary employers and economic engines. County government has long treated oil production as a “by right” activity requiring no local permits. But challenges by farmers and environmental activists in recent years have prompted oil companies to push for a kind of blanket environmental review and permit streamlining that would make it harder to halt local oil activity. Other agencies regulating oil in California indicate they hope to rely on the county’s environmental review for their own permitting processes. The proposed zoning amendment would bring new certainty in oil permitting, but only at the expense of new requirements and costs for petroleum producers. It would, in many cases, force oil companies to soften the impact of their work by buying air pollution credits and performing other mitigation measures that, until now, have not been required. It would also charge new fees. Environmental groups have objected to the changes, saying the environmental review is inadequate and that oil projects should be looked at individually. County staff have said they expect the ordinance amendment, if approved, to end up in litigation. Aside from its opposition by environmentalists, the proposed ordinance is viewed as controversial because it involves a legal issue called “split estates,” in which one party — a farmer, in this case — owns surface rights, while another owns the underlying mineral rights. This division has led to conflict because, some farmers say, oil companies have at times disturbed orchards and other farmland by taking out productive acreage, creating new roads and leaving behind new pipelines and tanks. Kern’s planning staff have tried to address both sides concerns by, in cases of split estates, creating incentives for mineral rights holders to get the surface owner’s signatures on oil-well drilling plans. If plans turned in to the county bear that signature, the permit application proceeds quickly. If it does not, the process moves much slower and comes with extra costs. This aspect of the permitting plan — what to do if the property has split ownership and the surface owner objects to the mineral rights owner’s plan — received a great deal of attention Monday night. Farming interests pushed for requirement of a conditional use plan or a mandatory meeting between surface and mineral rights owners. But county staff said either of these proposals could be used to stall oil companies’ plans indefinitely. Toward the end of Monday’s hearing, commission Chairman Ron Sprague appeared to side with farmers, saying he had seen a local case where a grower lost access to most of his property because of oil activity. Sprague proposed a series of measures not included in the staff proposal, including a property “setback” that would be more restrictive than staff had proposed about where oil facilities could be built. But his proposal failed to garner support from other commissioners, and it was not included in the final vote, which amounts to a recommendation to the Board of Supervisors. Under the final proposal, a surface right owner cannot hold up an oil project indefinitely. Some growers, most prominently Wasco grower Pacific Ag Management Inc., say no oil activity should be allowed of their property without their permission. County staff say they are unable to fully resolve such conflicts because California law provides little guidance on how to balance both sides’ interests. They note that although mineral rights owner have “dominance” and are entitled to “reasonable access” to the property, surface rights owners are free to pursue their claims in court. “We believe we have provided a reasonable pathway” to resolution of such conflicts, county Planning Director Lorelei Oviatt told the commission during a lengthy summary of the proposed zoning ordinance and how the county formulated it. Pacific Ag’s lawyers have asked the county to do more to require mineral rights owners to reach agreement with surface owners. Among other measures, they have proposed requiring oil companies get a conditional use permit in cases of conflict with surface owners. They county argues such a requirement is inappropriate and not supported by law. 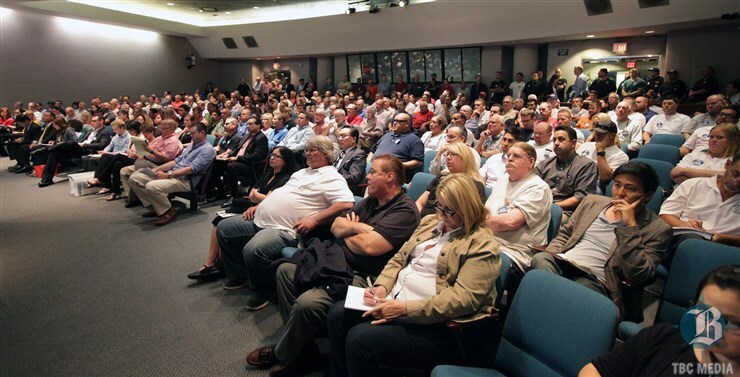 Hundreds of oil industry supporters crowded the hearing, many of them wearing buttons or stickers saying “I am the oil industry.” The turnout was an indication of how important the industry considers the proposed ordinance. Environmentalists argued the project’s environmental review was too broad, and that it effectively undermines state requirements that oil work be carefully examined for its impact on its surroundings. County staff, however, insisted the review is adequate. Oil and gas workers and several labor groups spoke in support of the permitting proposal.